Since January 2017, I’ve been in the process of downsizing my living space. I wrote in January about coping with the reality of needing to move to an apartment, because I could no longer afford my house. If you missed that post you can read it here. On the physical side of it, I have slowly been weeding through my possessions and now have a pretty large pile to take to a local flea market. Several large bags of clothes have been taken to my local Good Will store. Two Bagster (dumpster) bags with junk from the garage and shed have been carried away. My daughter has found a home to purchase and I’m on the waiting list for an apartment. But what emotions, anxieties, and desires this process has stirred up in myself and my family. It’s been an exhausting, scary process. First of all, digging through ones possessions, dredges up long forgotten experiences and emotions. It’s so annoying! Really, does that old well-worn Richard Scarry storybook have to bring up so many pleasant memories of snuggling with my little ones and reading to them? Then I want to keep it. I have no physical reason to keep it, but the memories make it hard to part with it. Finally, I tell myself to pass it on to someone who will read and cherish it with their little ones. But darn it, every book is this way! I have lots of books, requiring endless decisions and struggles with each one. They are like old friends. Who wants to part with friends? Then there are the gifts we’ve been given over the years. Every one requiring a decision. For example, I have two wooden jewelry boxes that I got from my grandmother. My favorite one has a broken hinge, so I don’t want to use it too much for fear of breaking it completely. Both of them are full of jewelry that I’ve been given and never wear. Practically speaking, I have no use for either, but I’m agonizing over what to do with them. Then I feel silly and get angry with myself for not being able to make a simple decision. Grrr! I’m avoiding tackling my dresser. It’s filled with clothes in various sizes that I can’t fit into. One of these days, I’m going to have to bite the bullet and open those drawers. But for now, I’m putting it off till later. I need to accept myself at the size I am and let the too-small clothing go. I’m just having a lot of trouble accepting it. The stress of thinking about whether or not to keep or get rid of each of my things, isn’t helping my tendency to stress eat. If you have ever attempted to weed out your possessions, you know what I mean. It’s exhausting emotional and physical work. Add in our health issues and the fact that our daily activities still need done, and that’s a recipe for a flare or health crisis. I’ve not done very well with this process. In March, I had bronchitis and the beginning of April brought asthma issues. I’ve not been taking care of myself like I should. Since, my downsizing process is far from over, I need to do better. 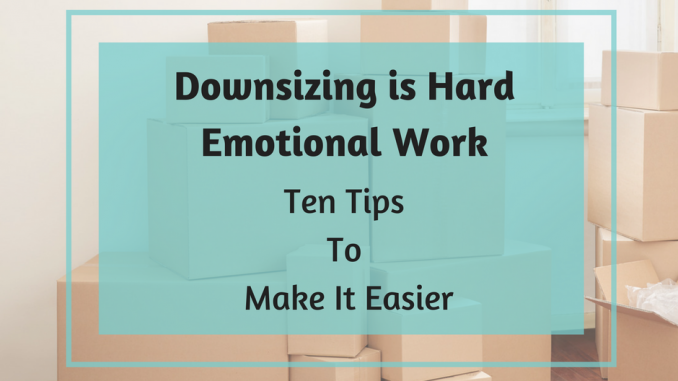 I created this list for myself and any of you going through this process of downsizing. Break it up into chunks of time: work for a bit then take a break. Remind yourself that you did not collect all this stuff in a day. It will take time to go through all of it. Be gentle with yourself. This is hard work! Be gentle with other family members. This is hard work for them also! Learn stress-reducing techniques if you don’t know any! Share memories with your loved ones and friends. Memories are precious. More precious than the stuff. Write about this process in your journal. It can be a record of those memories without having to keep the physical items. Take pictures of items that have special meaning, but that you don’t want to or cannot keep. I’ve been really struggling with this downsizing stuff. I felt that I needed to learn more stress-reducing techniques, so I’ve been doing an online class on meditation and relaxation with a wonderful teacher named Julie Holliday. It’s helping me to identify when I’m tense and reminding me to breathe and be mindful of how I’m feeling. I’m learning that I automatically fight or resist anything that’s uncomfortable. My default mode is to be defensive and therefore really tense. I’m beginning to see that even though I think I’m going with the flow of life and being flexible, that my body is always on high alert. If you have never given these practices a try, I highly recommend Julie’s classes. You can find out more about her here. http://www.mecfsselfhelpguru.com/ If you worry that her meditation instructions focus on particular spiritual beliefs, she is very respectful of differing practices and does not push any one belief system. She also suffers from health problems herself and takes them into consideration in her classes. Right now I am havingthe opposite problem with clothes. I have lost a lot of weight and find myself holding onto too big clothes just in case I gain it back. I wonder why we have so much trouble with clothing and weight? It’s like we don’t trust ourselves or something. Congrats on losing the weight, unless it was due to illness. Thank you for reading and commenting.